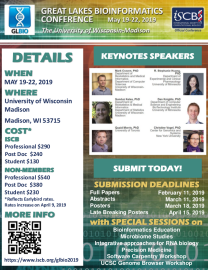 The Great Lakes Bioinformatics Consortium is pleased to announce a call for Volunteer Student Support Staff for its 13th Great Lakes Bioinformatics Conference (an official conference of the International Society for Computational Biology) (GLBIO 2019), the conference will be held May 19-22, 2019 at the University of Wisconsin-Madison. The conference provides an interdisciplinary forum for the discussion of research findings and methods, and development of long-term relationships and networking opportunities, for researchers within the region, as well as from around the world. 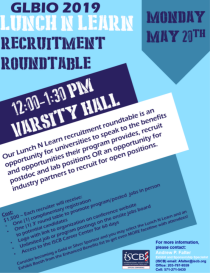 Only a small number of students will be selected to participate on this team. Apply today by completing the application online at https://goo.gl/forms/IUIZVA09CdCx2ebG3 by March 25, 2019. Sessions can be organized around contributed talks, invited talks, or a combination of both types, or may not have any talks (e.g., software schools and activities involving students and postdocs in training activities). Theme: one to two paragraphs describing the session, its research theme, and expected type of participants (undergraduates, graduate students, non-academic professionals, etc.). This section should also present a compelling argument for the importance and timeliness of the proposed session in the context of the bioinformatics community. Organizer(s): provide a list of the organizers along with a brief biosketch, email address, and webpage for each. Special Activities: Will your Special Session contain any special activities (ie. workshop, tutorial, demonstration)? Contributed Talks (optional for non-research proposals): Provide a list of researchers you intend to solicit for papers who are likely to be interested in submitting papers. Confirmed Speakers (optional for non-research proposals): Each session proposal must provide a list of at least four speakers who have confirmed they will speak at the session if asked. This list can include the organizers. It is acceptable for the confirmed speakers to be replaced by contributed talks. However, it is also acceptable to plan the session to have at least four invited speakers. The objective of this requirement is to ensure that if the session does not receive a sufficient number of high quality contributed talks, then the session can still take place. Session plan: Describe the structure of the session (e.g., number of contributed talks, invited talks, or other activities), and whether a half-day or full-day is needed. If your proposal is accepted, you will be responsible for most of the organization of your session, including: (1) creating and maintaining a webpage for your session, (2), deciding the session structure including length of time talks and chairing the session, (3) attending GLBIO 2019 and running the session, (4) if your session has invited talks or tutorials, communicating and coordinating with the speakers, (5) If your session has contributed papers, your responsibilities are to (a) solicit manuscripts, (b) obtain reviewers, assign papers to reviewers, and ensure timely return of reviews, (c) evaluate the reviews and make recommendations to the GLBIO program co-chairs regarding which papers should be accepted, (d) updating the webpage for your session with the list of accepted papers and providing the schedule of talks in your session. Final decisions regarding acceptance of submitted papers will be made by the GLBIO program co-chairs. 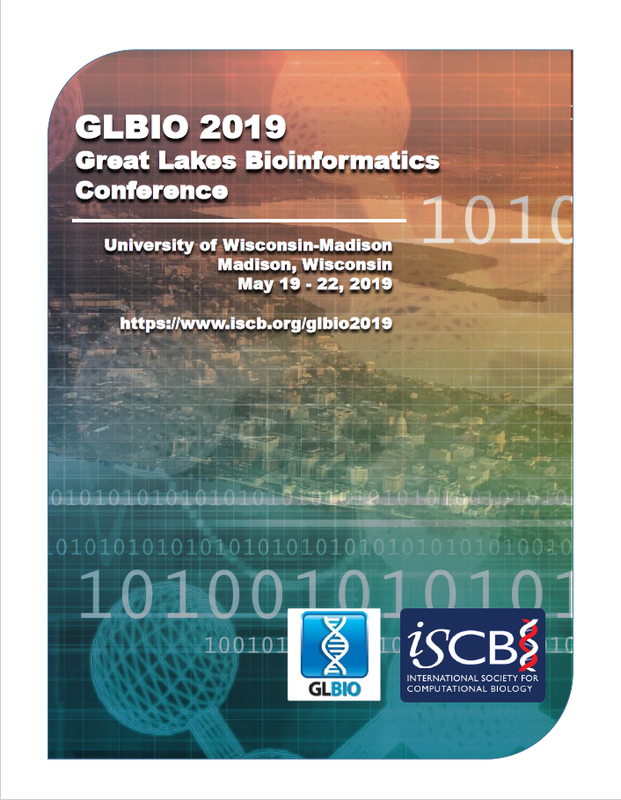 Note that as a session organizer with contributed papers, you will be a member of the program committee for GLBIO 2019, and contributed papers will be submitted through EasyChair. Accepted sessions will receive a complimentary GLBIO registration per 1/4 day (i.e., 2-hour) session; thus, a full-day (8 hour) session would receive 4 complimentary GLBIO registrations and a half-day session would receive 2 complimentary GLBIO registrations. Note that any additional expenses will need to be covered by the session organizers. Session proposals are due by September 17, 2018. These will be reviewed by the GLBIO steering committee and program co-chairs, and decisions will be announced by October 8, 2018.